ON JAN. 15, one of the first reports of US Airways Flight 1549's emergency landing in the Hudson River was made by Florida businessman Janis Krums: "There's a plane in the Hudson. I'm on the ferry going to pick up the people. Crazy." Krums didn't leave it as a voice-mail message, nor did he just text a few close friends: He broadcast the note to his Twitter followers, who then relayed it, screen to screen, all over the world. Krums's "man on the scene" report was one of the highest-profile moments yet for Twitter, the two-year-old Web service that has become explosively popular among the Web 2.0 set. Users can fire off tiny messages from their computers and cellphones, from wherever they are, and have them appear on the screens of whoever is keeping track of them. The messages answer the question "What are you doing?" to an audience of friends, family, or random strangers, or to no one at all. Twitter has already birthed an entire ecosystem of other sites that extend its power or interact with it. But Twitter isn't just a platform for technological innovation: It's showing signs as an engine of creativity for the language, too. Unlike blog posts, or Facebook status updates, Twitter messages are limited to 140 characters - short enough to be displayed on a cellphone. They can be painfully mundane ("Tuna fish sandwich, chips, & Mountain Blueberry Yoplait for lunch. "), or occasionally transcendent. The home birth of singer Erykah Badu's daughter Mars was narrated in real time by her partner, rapper Jay Electronica, in a series of tiny and moving moments ("I see the head. Full of hair"). As with many new communications tools - remember CB radio? - Twitter is already a productive source of new vocabulary. The messages are "tweets"; the people signed up to get them are your followers - or tweeple, or tweeps (although there are people pushing twerps and twits as the proper nomenclature). The Twittersphere (or Twitterverse) includes both the Twitterati (or Tweetstars) who have lots and lots of followers, and those who have just a few. It even includes tworkers - people whose jobs involve using Twitter. 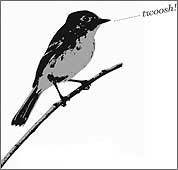 A twoosh is a message that fits the maximum of 140 characters exactly, without editing; there are also mistweets, retweets, and - when sent under the influence of alcohol - "dweets." Twittering too much may get you accused of Twitterhea, or cause your tweeple to "unfollow" you. Unfollowing might also be the punishment for other breaches of Twitiquette, such as using Twitter to send spam tweets (or speets). The convention of replacing the first letter of any word with "tw" to signify some kind of connection to Twitter can end up sounding like a stream of semi-demented baby talk. The words twaiting, twalking, twiking, and twirting for waiting, walking, biking, or flirting while using Twitter show up mainly in lists of words about Twitter, and not so much in actual unselfconscious use. But it's not just the twords that make Twitter interesting, it's the character limit, the implicit constraint of being interesting, witty, informative - in short, of being worthy of the limited attention of your followers. The best tweets of Twitter (some of them collected on the occasionally not-safe-for-work site Favrd.com) are more epigrammatic than newsy. Twitter demands writerliness in a way that instant messages, text-messaging, and even blogging don't. The question "What are you doing" is really an excuse to polish up the tiny moments of life, just as the best writers have always done. Twitter is also being used as a venue for some old literary forms: There are people writing short stories and even whole books on Twitter - called Twitlit or Twiterature, or, sometimes, Twittery ("poetry on Twitter"). These stories don't usually use any tw-words: Instead, they're more about pushing standard English to the limit, 140 characters at a time. Some authors try to compose an entire story in one 140-character tweet; longer works (including a "twiller" - a Twitter thriller - by New York Times writer Matt Richtel) try to sustain the narrative flow and readers' interest over a series of bite-size bulletins. They're interesting experiments, but, by trying to fit older forms into the new Twitter template, they seem to miss the point. The tweet, in essence, is a new literary form, one that prizes juxtaposition, humor, and directness, as well as concision. Twitter's contribution to the culture has not just been as a locus for wit, or the ever-increasing stream of tw-words, but also a new visual icon, the "Fail Whale." When the Twitter service is overrun by users and unable to keep up with the flood of tweets, it defaults to a charming picture of a whale being lifted aloft by little birds, with a message asking users to try again later. It's a measure of the affection people feel for Twitter that even its fail screen has become popular, with T-shirts and a Fail Whale Fan Club. And yes, some people call it the Twhale. Erin McKean is a lexicographer working on a new online dictionary. She blogs at www.dictionaryevangelist.com. Jan Freeman will return in March.